To many, the Castle class rather than the Kings were the epitome of the GWR. Aesthetically, they were easier on the eye and in better proportion than the Kings which, while they exuded strength and presence, were a bit too muscular in appearance in comparison with the Castles – the thoroughbred racehorses of the railway. The Castles also had an eye for fame and glamour: it was 4079 Pendennis Castle that embarrassed the larger Flying Scotsman during the trials of 1925 and then 5006 Tregenna Castle that starred in the 1936 publicity campaign proclaiming that the Cheltenham Flier was The World’s Fastest Train’. The names were attractive too and often associated with interesting places. When I lived in the Midlands, I used to like walking to the medieval Clun, Chirk, Stokesay and Eastnor Castles on the Welsh borders. When the GWR ran out of obvious geographical locations there were the ones named after WW2 aircraft like Spitfire and Gladiator, of which 5080 Defiant is the only survivor. And then there were the special names, carried by 5069 Isambard Kingdom Brunel, 5070 Sir Daniel Gooch and 7017 G J Churchward. It’s a pity none of those have been saved. A particular favourite with many people is 7005, Sir Edward Elgar and, indeed there is some Youtube footage of 5029 disguised as this engine in around 2001 somewhere. Living as I now do in Bristol, another lost Castle that people mourn is 5017 The Gloucestershire Regiment 28th/61st, named, quite late on, to commemorate the regiment’s action in Korea in the early 1950s. There is a picture somewhere of it withdrawn but polished up beautifully for a regimental event in Gloucester, after which it was unceremoniously scrapped. The Kings, with their raw power, routinely pulled 15 coach trains between the Midlands, the South West and Paddington but it was, again, the Castle hauled ‘Bristolian’ that took the honours, even in the 1950s and, during the last days of steam on the Worcester expresses, locos like 7023 Penrice Castle flew the flag until the end. In preservation too, 7029 ‘Clun Castle’ has always been a favourite and today, 5043 ‘Earl of Mount Edgcumbe’, an exceptional Bristolian engine while still with BR, has gone on to break records everywhere and astound people with its speed, efficiency and power. It is embarrassing class 8 pacifics all over again! So, I guess it’s not surprising that most of us have special regrets for the loss of certain Castles. The one that tugs at my heart strings, though, is still with us, just. 7027 Thornbury Castle, named after Anne Boleyn’s birthplace not far from me in Gloucestershire, was bought from Barry as a source of spares for Clun. It was later sold to Pete Waterman but since then is said to be ‘in store’ or, more properly, exile, at Crewe. I know that there are currently two Castles that possess mainline certification, 5029 and 5043, shortly to be joined by Clun but is there not a case for Pete Waterman letting Thornbury go to a heritage railway for restoration. The GWSR is the obvious choice, with its mainline history and a place where Castles were a common sight in GWR and BR days, particularly on ‘The Cornishman’. Come on, Pete. Let’s bring 7027 back to life! 7027 was a regular on the Oxford service. It was kept clean right to the end. One evening in June 1960 it was one of a pair of Castles on a regular train with the Queen Mother and her party travelling in two special coaches at the front of the train – they did not always use the Royal Train. For many years I was a member of the Standard Gauge Steam Trust at Birmingham Railway Museum, Tyseley. During this time I raised many hundreds, if not thousands of pounds collecting for the restoration of Thornbury Castle. I became a fixture standing in front of this engine with a collection box at Tyseley open days. Sad to say, the Whitehouse family and 7029 Limited agreed to sell her. If still at Tyseley, by now Bob & Alistair Meanley with their team would have got this famous engine back in working order, but remember there is only a limited amount of work for ex GWR Castle Class on the mainline and perhaps more important a limited amount of cash, labour and time to achieve this. 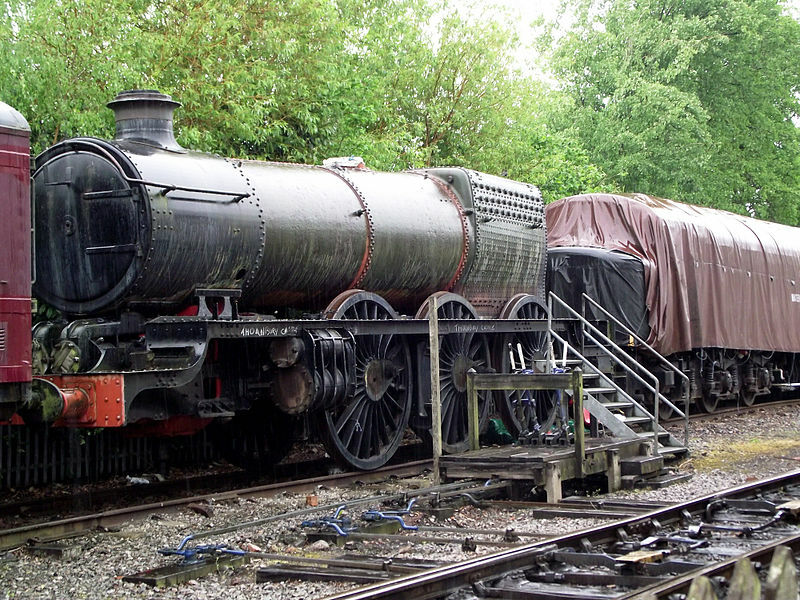 However, back to the present, I sincerely hope Pete Waterman will spend commit to a restoration budget from his financial resources to get her back in steam. I am sure he has not forgotten his treasured 7027 Thornbury Castle as she remains dear to his heart. 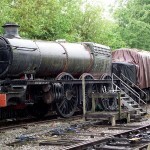 Yes, you are correct in saying she would look great at the Gloucester Warwickshire Railway – a fitting home. Pete is a great supporter of the Glos Warwicks and a keen Castle fan. I will write to Pete or speak to him in person to see what can be done. Watch this space……………. Andrew, I was absolutely delighted to read your comment. If Pete was to support the idea of 7027 moving to the GWSR for at least a cosmetic restoration in the short term, that would be wonderful. We will be at Broadway in less than 3 years time and then we will start to think about Honeybourne. I hope I live to see the day when we have our own mainline certificated Castle and a connection with NR for it to stretch its legs on! I think I could probably die happy then!